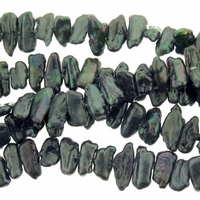 13-15mm Dark Peacock BIWI Side Drilled Pearl Strand. Nice luster and color depth. sold by the individual pearl bead strand. Quality freshwater cultured pearls always guaranteed.